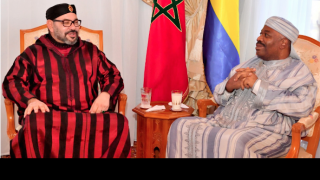 King Mohammed VI of Morocco visited Gabonese President Ali Bongo Ondimba of Gabon on Monday (Dec. 3), who has been recovering since November 29 at the Rabat military hospital. The king inquired about the health condition of President Ali Bongo Ondimba, and wished him a speedy recovery. The King’s call on the ailing president reflects the excellent relations and strong ties of friendship and solidarity binding the two countries. Footage of the royal visit aired by the Moroccan TV networks was the first photo of the Gabonese President since his hospitalization in Saudi Arabia for almost a month and his coming to Morocco for convalescence on November 29. The footage showed the two leaders sitting in armchairs around a small table and President Bongo drinking from a glass what seemed to be milk. The photo should put an end to persistent rumors and speculations about the health of President Ali Bongo Ondimba. Key government officials have already joined Ali Bongo in the hospital in Morocco to work on urgent issues. The Gabonese presidency said little about the health of the Gabonese head of state, with the spokesperson of the presidency, Ike Ngouoni Aila Oyouomi, issuing only two statements in more than a month, raising speculations about the seriousness of the President’s health. Newer PostGeneva Round Table on Sahara, an Opportunity for Confidence-Building Promotion?